Manuela Torres is 67. Homebound with no access to transportation, she stays inside her apartment all day, alone. Torres does not speak English and does not know where to go or how to get English lessons. She also has no health care benefits, and when sick, she toughs it out until she can get to Mexico, where accessing health care is much cheaper and easier for her. “Manuela Torres’ situation demonstrates the complexity that many elderly Latinos in Denver experience,” explains Therese Ellery, Rose Community Foundation senior program officer for Aging. In 2016, Colorado Latino Age Wave initiative (Age Wave), launched a grassroots pilot project to learn about and address issues faced by Latino elders in Metro Denver. Montbello, a Denver community where 60 percent of the population is Latino, was selected for the pilot. The project leverages conectoras — Spanish for connector — who are Latinas from the community serving as community organizers and health care navigators. They organize monthly community meetings which provide a venue to convene, listen to and explore solutions with the Montbello families. Through this effort, Age Wave and the conectoras have uncovered three priority issues: access to medical services, social isolation and access to dental and vision care. The community is working together, with guidance from Age Wave, to find positive solutions to these challenges and has already begun making meaningful changes. 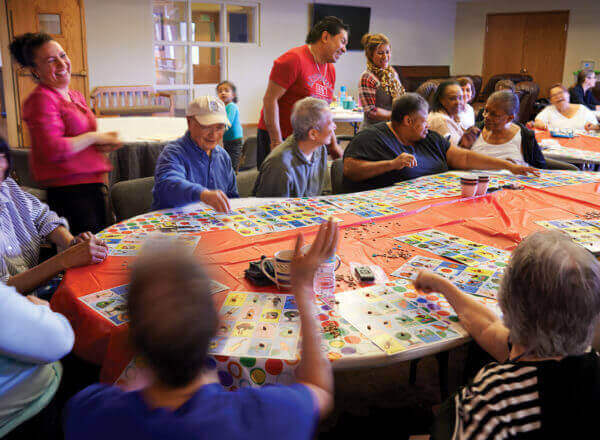 The monthly meetings alone have led to building trust and stronger relationships with local service providers and new social opportunities, such as monthly bingo, to meet other residents and stay active. As for Manuela Torres, she has become actively involved in the monthly meetings and never misses a bingo game. “I don’t feel excluded anymore. I feel like I belong to something,” she happily proclaims. Colorado Latino Age Wave is a program of the Latino Community Foundation of Colorado. In 2007, the Latino Community Foundation of Colorado (LCFC) was launched by Rose Community Foundation in partnership with Hispanics in Philanthropy, The Jay and Rose Philips Family Foundation of Colorado, Western Union Foundation and individual Latino leaders, to be a resource in the community and a catalyst for positive change.